The Gramophones Theatre Company are back with their latest show - Wanderlust - which will be performed at Derby’s Guildhall Theatre on May 12 and at Belper School Theatre on May 14. Presented by Arts Council England, Creative Arts East, Create Theatre and Village Ventures, the dates form part of a national tour for the Nottingham-based, all-female trio of performers. Armed each with a Dictaphone and a pair of Wellington Boots, three women began a search to satisfy their lust for adventure. Hunting in forgotten corners of the country they made it their mission to bring back the most exciting tale. Kristy Guest, from Beeston, hitchhiked her way around Nottinghamshire on mobile libraries; Hannah Stone, from Chesterfield, hijacked passers by in Norfolk they both collected stories of epic journeys, risk taking, adventure and life changing circumstances. Ria Ashcroft, from Ilkeston, was invited into nursing homes to chat with the inhabitants and help them create stories, which led her to unravel her own family story of a hereditary disease. Returning with a variety of different stories some about life changing moments, others about funny surprises, and even one about getting lost in the jungle, the three set about making a theatre show that would honestly tell these stories. Wanderlust weaves stories together using humour, verbatim and beautiful live music to take the audience on an uplifting journey. n Flamenco Edition is presenting a show from 15 called Cádiz on Friday, May 8, from 7.30pm. The show by Jesús Fernández is to be performed at Deda, the regional dance house based on Chapel Street in Derby. Under the artistic direction of Ana Garcia, Flamenco Edition commissions, produces and promotes the finest, most authentic flamenco art across the UK. 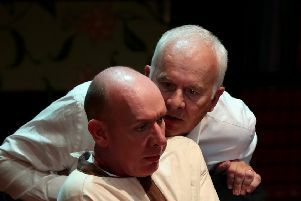 Jesús Fernández’s new production of Cádiz portrays his personal reflections on his Andalucian roots.